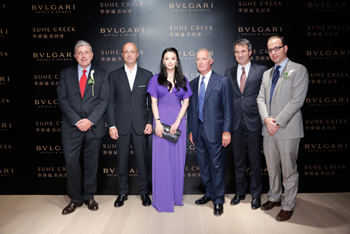 Holding Bulgari Hotels & Resorts with OCT Group to open in 2015 in Shanghai, a brand new hotel Bulgari. Hotel in Shanghai is the fourth hotel that follows will open in early June, the hotel in London. The hotel will be located in the building business complex, located in the cultural district of Shanghai – Sukhbaatar Creek, which is known for its cultural life. To be built next to the traditional Chinese houses elegant skyscrapers, and will be restored the temple of the Queen of Heaven, Khin Tau. The 40-storey hotel complex will occupy 12 upper floors designed architectural firm Foster + Partners. Another well-known team of architects Antonio Citterio Patricia Viel and Partners, designed the resorts and hotels in the brand in London, Milan and Bali. Featuring impeccable design, the new hotel has interior in the style of the firm Bulgari, conceived as a unique interweaving of modern and traditional styles that reflect the identity of Sukhbaatar district, where the old architectural masterpieces are interspersed with the business centers of the new generation. The hotel provides 120 rooms of different types, including deluxe and superior area of 400 square meters – one of the largest in Shanghai. A panoramic restaurant, a rooftop bar and luxurious Italian cuisine the hotel have all the chances to become one of the favorite options. It should be noted that the hotel will be a spa center with a total area of 2 thousand square meters. m with an indoor pool and a ballroom.